Forever ago, I had a vision of starting a new website. 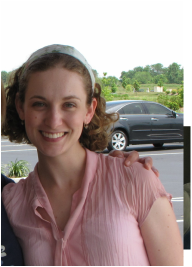 It took a few years of self-discovery, but I'm happy to announce the launch of my new, fledgling site: www.perfectlypromised.com. Not that I haven't loved Whole Foods for Whole Families. Despite not having blogged or added recipes in a long time, I still get thousands of visitors a month. My goal with this site was never to build a foodie blogging empire, but rather an exercise in writing and creativity during an adventurous time of parenthood. In the meantime, I found God, as cliche as that sounds. But totally true. With it, I felt a purpose and drive to use my writing to reach people in a new way beyond food. Perfectly Promised is a place for women to come, relax, and fill up their cup on the hopes and promises God has for all of us. It's safe, judgment-free and most of all, from the heart. If that sounds like something you're interested in, please join me there--and send me a note to say hi! Sadly, this means blogging for Whole Foods for Whole Families has officially ended. However, I will keep the site live as long as people keep visiting for recipes. On to the next thing. . . . 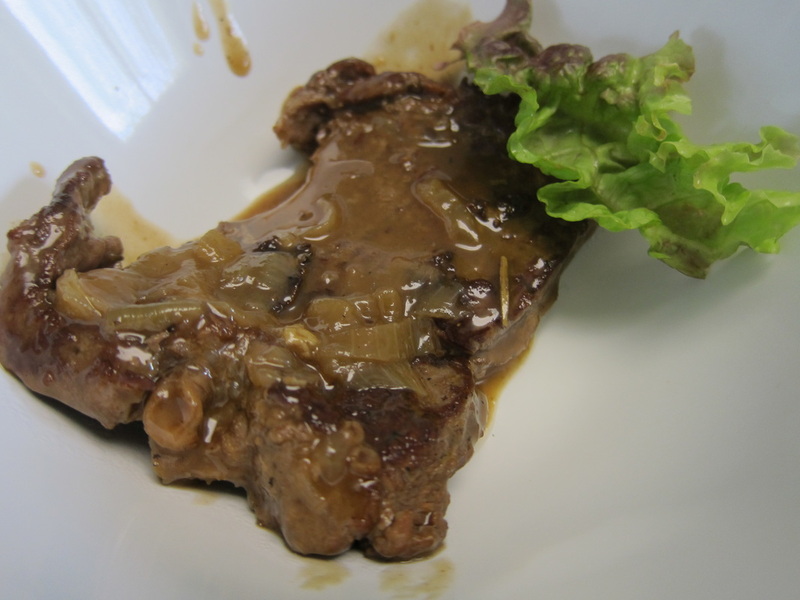 Looking for a trusted producer of quality grass-fed and pastured meat? My friends at Seven Sons Farms based in Roanoke, Indiana have been our family's trusted source of meat for over 5 years. They raise grass-fed cows and pastured chicken and pork--the way nature intended! Afraid you don't live close enough to enjoy the great taste of Seven Sons? The farm delivers to dozens of locations throughout Indiana, Ohio, Illinois, Michigan and Kentucky. AND they've just introduced home delivery and shipping options! Just order online and choose your delivery method. Now enjoying healthy quality meat from a farm you trust has never been easier. Use the button below to receive a special discount when you checkout!! I can see into the future. . . So I've hinted before my desire to revamp this site. I had some pretty big ideas about what I wanted the new version to be like, and then I completely dropped the ball. Life caught up with me, I guess. You know, kids and stuff. Or laziness. Yeah, probably laziness. Anyway, my new site is officially in the making now. I started building it last week, and I hope to have it up and running in a few months. At that time, I will attempt to divert traffic from this site to my new one. Did you know I get about 8,000 views a month on this thing?? Yeah, and about 1,200 of you are new visitors each month. Thanks you guys! I don't want to lose any of my visitors to Whole Foods for Whole Families, so I will do my best to keep what you guys are looking for on the new site. However, my new blog will NOT be a recipe blog. It will have some recipes, yes, but not as many. So if there's a recipe on here you like and don't want to lose, please let me know in the comments so I will make sure it makes it to the new blog. So this is a heads up, folks! A new adventure on the horizon. I hope you stay with me! Thank you for all you souls visiting my site each month! PS - My friends at www.BetterLabTestsNow.com are offering my visitors a special promotion. Use promo code "WHOLDFOODS" at check out to receive free overnight priority shipping! Yay! Out with the old. . . It's coming. Another new year. 2016. Why does time go faster as an adult? Didn't Y2K just happen?? As the new year approaches, articles inevitably pop up about common resolutions people make, mainly losing weight and exercising. But also other things like being organized or productive or super awesome. I'm already super awesome, so I usually skip that resolution each year... at least that's what I tell my husband. Ha! I also saw an article about why we shouldn't set resolutions, how we're great just the way we are, we should love ourselves and quit striving for something new. While I'm not super serious about setting concrete New Year's resolutions, I do think a new year is a great time to look back at our lives and try to make improvements. After all, isn't one of life's greatest gifts the ability to learn and grow as we mature and age? I cannot imagine myself stuck in my 20-year-old mind. Anxiety, lots of nervous energy and immaturity. No, thank you. And I hope in another fifteen years, I've grown even more to become a more wise, generous person, slower to anger and easier to forgive. That leads to me to ask myself what I'd like to work on this upcoming year. What will make me a better person? Or my life happier? Or teach my children important life skills? Or give me better health and longevity? There are so many areas to work on I feel like it can be hard to focus. So allow me to adjust the lens a little. I hope my list will motivate you to make your 2016 a great year, too. *Regular meditating by using my new adult coloring book. Yay! *Regularly exercising, even if it's just walking the dog. *Begin more strenuous exercise like weight-bearing exercises (since my adrenals are rebounding). *Stretching regularly (hello, tight hamstrings). *Feeling grateful each day, finding joy in every day activities. *Spending a small amount of time each day connecting with God through prayer, scripture, or reading a spiritual book. How many of you feel stressed out? I'm talkin' about being tired and anxious and overwhelmed by trying to get it all done in one day -- go to work, clean the house, make dinner, make sure the kids do their homework, pay the bills, take Timmy to soccer practice and Susie to Girl Scouts, and still have energy and patience to be a gracious spouse and loving parent, etc. My mission to health has included a lot about food, but even more, it's been about reducing stress. So here are some tips we use in our household that help myself, my husband, and my kids live a happier, less anxious life. Yeah, this seems pretty basic, and for those of you who have already accomplished this, kudos to you. But there are a lot of people and families out there who shy away from routine. Maybe they're afraid of being boring and predictable. Or maybe they feel so frazzled that making a routine feels like another insurmountable task to be tackled. But formulating a routine is well worth the effort, trust me. Your kids will love it especially. To start, think how your average day flows. Make note of what time you wake up, get ready for the day, eat breakfast, etc. If you have school-aged children, have your routine include homework time (ours works best right after school, then it's done and my kids can play the rest of the evening). Try to make dinner around the same time each night. And set a time for the kids to get ready for bed so they know what to expect. Trust me -- your household will flow so much better! then fast forward to the afternoon . . . This can sound daunting even to an organized parent. But posting house rules sends a clear message to your kids about what you expect from them and takes the stress off of you to constantly remind them. And don't forget to write out clear consequences for breaking the rules. Actually, I feel the consequences are the most important part. Our household has fluctuated with rules over the years -- after all, they do change as the kids get older and mature (I don't have to tell my 9-year-old not to throw food on the floor, for example). There have been times when we've had clear rules typed and posted and other times when we're just winging it. But when we've been flying by the seat of our pants parenting and our kids do something inappropriate, my punishment changed according to how I felt at that time. It was inconsistent. So if I was feeling more fatigued and grumpy one day, the punishment might be more severe than on a day when I felt better. I tried hard not to do that, but hey, I'm human, you know. Writing out clear consequences took a lot of stress off of me. I'm not forced to think of punishments on the fly (and mood dependent). Plus my kids know what to expect if they break a rule so they're more likely to take the punishment without a fight -- and that's a huge stress relief, too! Okay, so this is the task I like the least. And I'm guilty of not having made a meal plan for the past few months. But hear me out on this one. Making a plan for your meals will release any stress you feel about what to make for dinner tonight. Trust me! I recently read an article that stated making dinner caused mothers great anxiety and grief. No doubt some of this stress is from the daily task of figuring out what to make for dinner that night. Many factors affect the dinner-making decision -- how much time do you have, any after-school activities, a late spouse, etc. But dinner doesn't have to cause a panic attack. Grab your calendar, and sit down with a blank monthly meal plan calendar (pick one of these), and look to see which nights you may have something going on. Start at the beginning of the month and write out dinners for each day. If you get to a day that's busy, make sure your meal is quick and easy (or maybe this is a Pizza Night). And that's it! You're done for a whole month and you can relax! Not only does a monthly meal plan take away the stress of making dinner, it also makes grocery shopping easier and less stressful! You'll go the grocery store less often and save money, too! Bonus! "No" isn't just for drugs anymore. If you want to reduce your stress, keep extra activities to a minimum. Yes, your first grader got invited to two birthday parties in one weekend, but that doesn't mean your kiddo has to go to both. Just say no and have them choose one. Or your daughter is already taking swim lessons when she tells you her best friend is going to tennis camp, too. Just say no. My motto is: one activity at a time. Pick one. Just one, and that's it. We as parents want our kids to have all sorts of opportunities and experiences so they can find their niche in life and grow up to be well-rounded adults. That's great, but it doesn't mean they need to cram in as many activities as possible into their day. So let your kid pick one activity -- just one. And if they want to change later, then so be it. But limit the amount of time your family rushes around to after-school activities. Your kids will be fine if they don't do synchronized swimming, soccer, piano lessons and art club all in the same year. And your stress levels will be that much lower. Yes, I know, another routine. But while the house routine helps the kids, making a cleaning schedule helps you. First, if you clean your house a little each day, you'll avoid spending an entire Saturday dusting, vacuuming, scrubbing bathrooms, doing laundry and putting away clutter. And secondly, when you make a schedule, you know what to expect of yourself! That may sound silly, but it's true. Finally, keeping up on housework avoids the stress-induced, super-rushed, panicked cleaning when company spontaneously shows up at your house. My schedule allows me to leave the weekends free of chores which has been great for allowing more time for our family to play together. A huge stress relief! Just by doing a little bit each day, my house stays clean and organized PLUS we have all weekend to do what we want. This may tie into #3 Make a Meal Plan, but I felt this needed its own category. Why? Because the slow cooker is my best friend. We don't eat out much, which means I make A LOT of meals. And sometimes I just don't feel like cooking. If you're gone all day and come home too tired to cook, let the slow cooker do it for you! No, it's not cheating. It's called awesome time management skills. So don't feel guilty and revel in your genius idea to have a great dish ready when you walk in the door after a long day. To get yourself started, check out these awesome recipes. Okay, this one may sound like more work, but it's really not. So imagine you already have the oven fired up or the skillet hot or the pot boiling. Now all you have to do is cook a little extra to make some left overs. Why? Because left overs give you something quick and easy for lunches to keep your stress low AND left overs can give you a break one night for dinner. If you're baking sweet potatoes, put in a few more for a night when you don't have time to bake. Or throw in some sausage patties so you'll have breakfast for the week. Or cook up an some extra stalks of broccoli to serve with dinner the next day. A little extra planning can give you huge gains in the long run. In fact, you're probably seeing a pattern to this by now: make a plan = less stress. Go to bed!! Seriously, folks, go to bed. Staying up late to watch Jimmy Fallon may seem like a great idea (he's awesome, by the way), but when 6 am rolls around and you've only gotten 6 1/2 hours of sleep, your brain is going to be junk. And when you can't think straight, life -- and stress -- are hard to deal with. I know, I know, a lot of you will say you do just fine on 6 or 7 hours of sleep. But you're wrong. I'm telling you. You need 8 to 9. No exceptions. Don't believe me? Then watch this TED talk. So turn off the TV and just go to bed. Try it for one week and if your body doesn't feel better equipped to handle stress, then you can tell me. You can write me a nasty comment about how I ruined your life. But until then, forget all the stigmas about going to bed early and get some sleep, people! I hope these tips can help you and your family lessen your stress. I know they've helped us! Do me a favor. Take a moment to think about some of your favorite, most cherished childhood memories. Think about the things that made you happy, times you look forward to, and the things you'll never forget. I'll give you a minute to ponder . . .
. . . Okay, are you done? What did you come up with? For me, it was coming home from school each Valentine's Day, rushing to my room and feeling the pure joy and excitement of seeing the box of chocolates my mom had left on my pillow. The anticipation had been building all day. I spent an unusual amount of time at school looking at the clock, willing the second hand to move faster so that it could be time to go home already. And when I finally made it home and sprinted to my room, I inhaled the sweet aroma of chocolate that hung about my pillow, and at that moment, all of my dreams had come true. I know, it may sound dramatic with all of my dreams coming true over a Whitman's Sampler. But I was a kid, and I loved chocolate. And I loved the fact my mom always left it on my pillow on Valentine's Day. This memory of mine imprinted itself upon me more than most because it was a family tradition. I looked forward to it every year and the act of placing the gift on my bed the same way each year added a special touch to the experience. And I'm betting most if not all of the memories you thought of about your childhood also stem around a tradition, something you or your family did on a regular basis. Am I right? So what's my point to all of this? I feel traditions are a dying art. We all want to give our kids a great childhood full of magic and happiness. But instead of relying on simple activities that bring families together, many of us feel we need to provide great big experiences in order to make incredible memories they'll never forget. I cannot tell you how many times I've seen someone post pictures on social media about a trip they've taken with their kids to a theme park, the beach, the ski slopes, or a carnival with the caption "Making Memories" in big letters. We assume bigger is better and that a simple weekly pizza and movie night cannot compare to a trip to Disney. Or that a trip to the skip slopes will be more memorable than snuggling up before bed to listen to mom read a story each night. But we're wrong. Because simple is better. Period. I'm not saying family vacations aren't great, because they can be a lot of fun. But they're not the activities our kids will remember the most about their childhood. Just think about your own self as a kid. I'm sure you remember some trips you took and have some neat memories from them. But when I first asked you to think of your best childhood memories, I'm betting a vacation wasn't one of them. So what are some easy, inexpensive ways to add traditions to your family? Pizza and Movie Night. We do this every Friday and my kids love it. In fact, my youngest declined a birthday party invitation so she wouldn't miss Pizza and Movie night (then I told her we could move it to Saturday and she decided to go to the party). Game Night. Dust off a game, sit around the table and have fun! Big Sunday Dinner or breakfast. Note in your kid's lunchbox every Friday. Could be a note to say you love them or to wish them a good day. Or it could be a joke to make them laugh. Donuts after church or baseball practice or dance lessons or . . .
Take a walk or bike ride after each dinner in the summer. Take one of your kids on a date once a month (especially great for fathers and daughters). It can be out for pizza or maybe just ice cream or to the park for some one-on-one time. Eat dinner around the table every night and talk. Hug your kids first thing in the morning or the last thing you do at night. Weekly dance-off. Pop in the Just Dance disc into the Wii and bust a move. Just remember to close the blinds to avoid any awkward conversations with your neighbors. Story time before bed. Turn off the TV and put away the phone. Snuggle up on the couch or in your bed, grab a book and read a story (or a chapter) to your kids each night. Many of us have mastered the yearly traditions, usually because they're from our own childhood. But these traditions are important and not to be forgotten. So let's review some old ones and add some new ideas. Make same batch of cookies each Christmas. For me, we made chocolate crinkles, and to this day, I crave these cookies every holiday season. I'm determined to make a Paleo version so I can enjoy them again! Open just one tiny gift each Christmas Eve. I tried to get my parents to do this but to no avail! Put a special treat in your child's lunchbox on the first day of school. Get your child's favorite candy or chocolate each Valentine's Day (and put it on their pillow!). Take a vacation to the same place -- a cabin on the lake or a local national park or a beach house. It doesn't have to be fancy or expensive, just find a place you love where you can relax and have fun. Each Thanksgiving, pull out the same white table cloth and have everyone write what they're thankful for (use fine tip Sharpie markers, iron on hot before washing to prevent bleeding). Use the fine china plates for a special, fancy dinner. We do this for Christmas or Thanksgiving. Pick out and cut down your own Christmas Tree. Drink hot chocolate whenever there's a snow day. Traditions are important to making our lives rich, to bonding families and to creating the most special memories we live with for our entire lives. More than the pricey one-time vacation to the theme park, they give ourselves and more importantly, our children lasting memories connected to deep emotions. We feed our families good food, now let's feed them soul food. What's your favorite childhood memory? What traditions do you do with your family? James and I are ice cream junkies. Back in our gluten and dairy days (oh, so long ago), ice cream was a regular staple. Chocolate, vanilla, mint chocolate chip, or chocolate chunk. In a big bowl with melted peanut butter and a squeeze of Hershey's chocolate syrup, please. And a maraschino cherry if I was feeling spunky. We ate ice cream the way others enjoy a glass of wine at the end of a long day. But we don't drink wine... or beer... or hard liquor... and we don't smoke, so we found our solace in a bowl of ice cream. Really bad days, when regular ice cream just wouldn't cut it, one of us guiltily rushed out after the kids went to bed to a local frozen custard shop for the "good stuff." It was our hard liquor. My love for ice cream has not waned despite my intolerance for dairy. So James came to my rescue. Actually, he came to his own rescue, too, because he loves (and misses) ice cream as much as I do. I've even had to talk him down from an ice cream ledge a couple of times after a really tough day. "Just think about how bad you'll feel afterward!" James has always been the ice cream maker in the house. 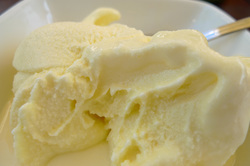 He modified our old dairy recipe to make a dairy-free and refined sugar-free frozen custard that is so creamy. I'm not just saying that either -- this stuff is awesome. 1. In a large saucepan, heat coconut milk over medium heat until it just starts to simmer. Split the vanilla bean in half, scraping the inside of each side and set aside. 2. In a medium bowl, whisk together egg yolks and honey vigorously. Ladle a small amount of warm coconut milk to the eggs and whisk to combine to temper the egg yolks. Continue doing this until about 1/3rd of the coconut milk has been added to the yolks. Pour the remaining coconut milk in with the egg yolks, whisk to combine. Whisk in scrapings from vanilla bean and add vanilla bean pod to the milk. 3.Pour the entire mixture back into the large saucepan. Heat over medium-low heat until it reaches about 170 to 175 degrees. The mixture will be thick and easily coat the back of a spoon. 4. Transfer the custard base to a large bowl or measuring cup (like one of those glass 8-cup measuring cups) and allow to cool for about an hour. Fish out vanilla bean pod. Add vanilla extract and stir to combine. 5. Refrigerate overnight (or 6-8 hours if that fits your schedule better). Pour into your ice cream maker and follow your maker's instructions. 6. Try your best not to eat it all at once. 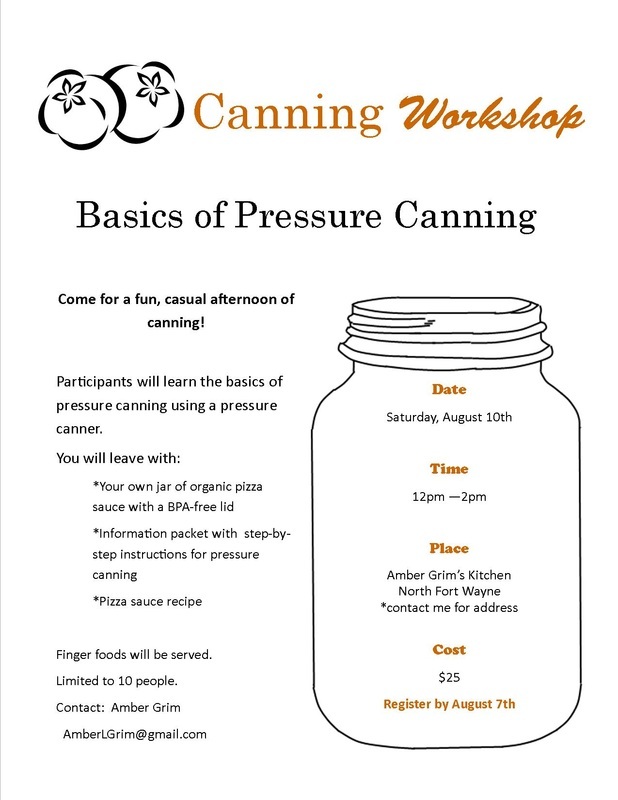 Sign up for the Canning Workshop!